Injuries to the leg and knee can make it impossible to earn a living, exercise, or do any number of other daily activities. Among the most common leg injuries are those involving the four knee ligaments: the anterior cruciate ligament (ACL), posterior cruciate ligament (PCL), medial collateral ligament (MCL), and lateral collateral ligament (LCL). Injuries involving these ligaments are often the result of workplace incidents or accidents cause by third parties, such as automobile collisions and slip-and-falls. If you have sustained a knee ligament injury as a result of someone else’s negligence, or a workplace accident, contact the Raleigh personal injury attorneys of Maginnis Law by calling 919.480.8526 or sending a confidential email inquiry using our contact page. The four ligaments of the knee can each be injured in different ways. By far the most well-known of the ligaments is the ACL, a criss-crossing ligament that connects the upper leg bone to the lower leg bone. This is in no small part due to the number of ACL injuries sustained by professional athletes. Injury to the ACL typically occurs when your foot is planted and your leg stretches too far forward. This can occur do to your own action, such as by suddenly changing direction, or by taking a blow to your knee. The PCL, posterior cruciate ligament, works in conjunction with the ACL and can be injured if you take a blow to the front of your knee, such as by a dashboard in an automobile accident. 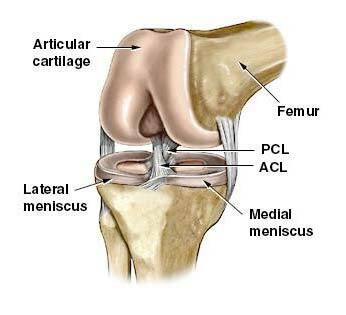 The MCL can be injured with a blow to the outside of your knee, while the LCL can be injured in the rare blow to the inside of your knee. The first indication that you may have suffered an ACL tear is the hearing of a “pop” sound or the feeling of the joint shifting. Other indications include instability, swelling, and pain. Unlike many other injuries which require an MRI, an ACL tear may be diagnosed with a physical examination only. The ACL reconstruction surgery itself requires the doctor to attach new tissue to the torn ACL, such as tissue from the patellar tendon or hamstrings. Treatment of PCL tears is much different and more conservative. Because of the difficulty associated with PCL reconstruction, doctors typically only recommend surgery for Grade III tears. For lesser tears, physical therapy, ice, and other non-surgical techniques are utilized. If you have sustained a PCL or ACL tear as a result of a workplace incident or an accident caused by a negligent third party, you are entitled to recover fair compensation. For non-employment related injuries, you may recover, among other things, damages for medical and pharmaceutical expenses; lost wages and/or diminished earning capacity; physical, mental, and emotional pain and suffering; and temporary/permanent disability. For workers’ compensation claims you may recover, along with the cost of your medical treatment, damages for temporary total disability and permanent partial disability. The knee injury attorneys of Maginnis Law provide free consultations to all prospective automobile accident, slip-and-fall, and workers’ compensation clients. If you are unable to come meet with us, we’ll travel to meet with you. To make hiring an attorney more feasible, we offer contingency fee arrangements. This means that you do not pay any attorneys’ fee unless we are successful in obtaining a recovery for you. To discuss your knee injury claim, contact attorney Shawn Howard at 919.480.8526 or send the details of your case using our contact page. Our accident injury lawyers handle automobile accident and workers compensation cases throughout North Carolina, including Raleigh, Durham, Cary, Chapel Hill, Pittsboro, Apex, Wake Forest, Greenville, Fayetteville, Sanford, and Wilson.